COMPANY PROFILE DCB Bank Ltd is focused on the provision of comprehensive banking solutions. It serves corporate and individual customers with services such as retail and wholesale banking and treasury services. DCB Bank Ltd is an Indian commercial bank catering to corporate and retail customers. Its banking operations are structured into the retail banking, commercial banking, treasury operations and other businesses. It depends primarily on its retail banking operations for the core of the bank’s revenues. Through this segment, it handles the lending, deposit taking and other services offered to retail customers. The Corporate/Wholesale Banking segment includes lending, deposit taking and other services offered to corporate customers. The treasury operations encompass all financial markets activities such as trading, maintenance of reserve requirements and resource mobilization and the other banking operations segment includes para banking activities and merchant banking. 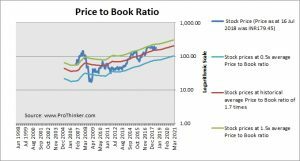 At the price of INR179.45 as at 16 Jul 2018, Dcb Bank Ltd is trading at a Price to Book Ratio of 1.9 times current book value. 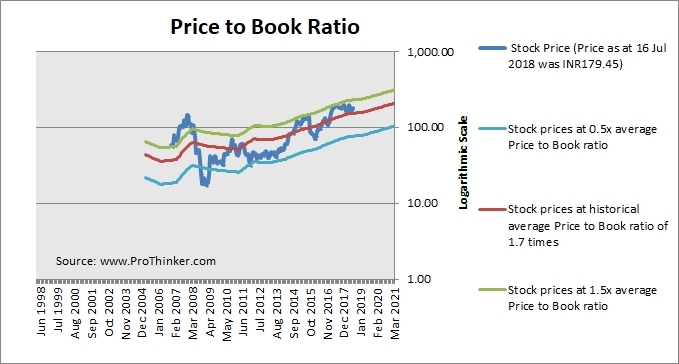 This is a 17% premium to its historical average Price to Book Ratio of 1.7 times.